Although I had largely forgotten about it, somewhere in the recesses of my brain, it resided, because I was thirty-minutes early for an appointment in Falls Church today, and – <blink> – I remembered. 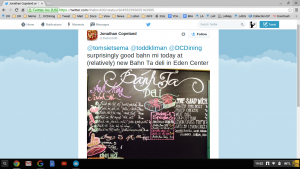 I didn’t remember who sent it, and I didn’t remember the name of the restaurant; merely that someone I trusted had mentioned good Bánh Mì in Eden Center – I pulled in. Bánh Ta is a tiny little pillbox boutique, just a few stores down from the outstanding Thanh Son Tofu, which has the best tofu I’ve found in the DC area. Despite being just a counter, it’s very upscale looking, with market goods and an atmosphere that reminds me of a smaller version of the incredible Phu Quy Deli Delight. If you haven’t been to Thanh Son Tofu or Phu Quy Deli Delight: GO! I ordered a #1, Pork Belly (Bánh Mì Thit ? ?, $4), the ?? being on the sign in the first link in the previous paragraph, and absolutely indecipherable by me and my illiterate Vietnamese (my apologies to native speakers – any guidance will be much appreciated). It’s no secret that I haven’t exactly been blown away by DC-area Bánh Mì – in fact, the only ones I’ve had that I even consider “good” have been somewhat Americanized (Dickson Wine Bar and the underrated and under-appreciated Ba Bay). Until today, that is. Thanks to Jonathan’s recommendation, I’ve now had what I believe to be the first authentic Bánh Mì that I can say, with my European-influenced palate, and with an absolutely clear conscience, is *really, really good*! You don’t even need a second one to fill up on, as the size is ample, so both qualitatively and quantitatively, we have ourselves a front runner in the local Bánh Mì wars – you could say, if you valued bad puns more than honorable use of language, that this Bánh Mì, won me. These three storefronts in Eden Center are less than 100 yards away from each other, and justify a special excursion to experience. I am – *finally* – sold on the merits of this sandwich, and I suspect that in Vietnam, it gets even better than this. Absolutely initialized in Italic in the East Falls Church section of the Virginia Dining Guide, and I’m very much looking forward to a repeat visit, thanks to the recommendation of Jonathan Copeland. 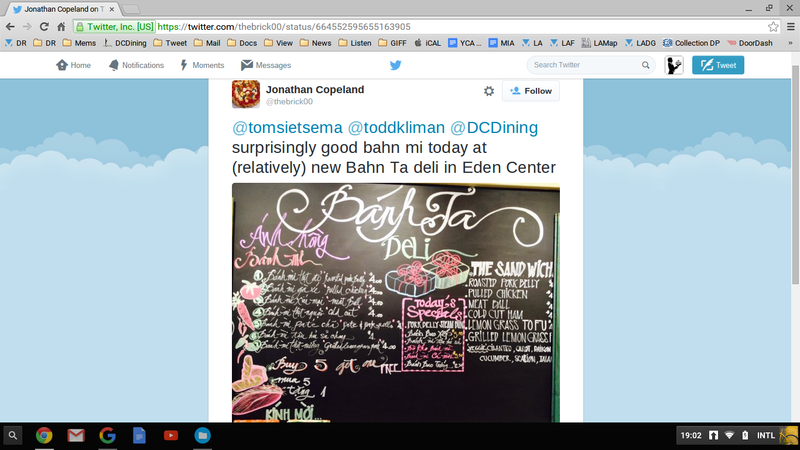 This entry was posted in Restaurants, VA and tagged Banh Mi, East Falls Church, Eden Center, Falls Church, Market, Prepared Foods, Vietnamese. Bookmark the permalink.